Good table selection is important if you want to maximize winnings from your time spent playing poker. If you want to make the most money possible, sit down with players who are worse than you. To win money from poker, you can either develop a better strategy than your opponents, or play against worse players than you. 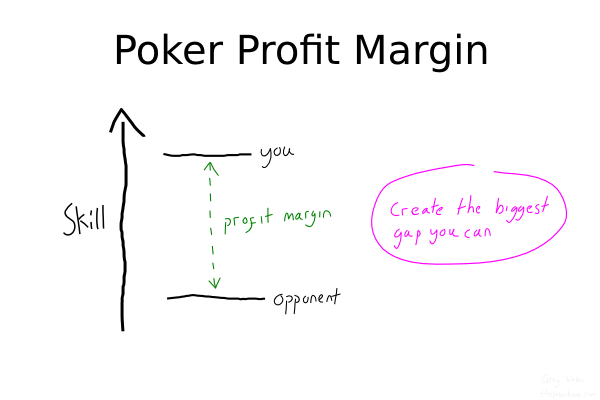 Your potential margin for profit against any player is proportional to the gap between your ability to play poker and theirs. In casinos you have a limited choice of tables to sit at, so table selection is a little trickier when playing live poker. However, with online poker you have the opportunity to choose from a long list of tables. You should take advantage of this freedom of choice. Not all online poker rooms are created equally. Before selecting tables, think bigger and choose which online poker room you want to play at. The company – are they running a sportsbook or casino as their main product? Can these gamblers easily drift over in to the poker room, or are they mainly attracting those who already play poker? The poker room design – is it fun and casual, or cold and serious? The bet slider – does the room make it easy to bet more optimal bet sizes by default, such as ¾ pot? Or are new players given freedom to make their own bet sizing mistakes? Is there anything else that could cause more bad players to play at this particular poker room than somewhere else? What makes this poker room different? It could be anything. The online poker ecology morphs and evolves over time. The softest poker site today could be a shark tank a year from now. Play at different locations and don’t be afraid to spend most of your playing time at the room that "feels right" to you, even if it’s not the most popular destination right now. You can play poker anywhere you like, and you should; just be sure to know why you’re playing there. Tip: Don’t follow the crowd. You don’t make money from poker by doing the same thing everyone else is doing. You’re a poker player; you make your own decisions. Online Poker pools together players from all around the world, so there are literally lists of tables to choose from. But how can you determine which tables may be more profitable than others? Firstly, some poker rooms online will give you table stats in the lobby to give you a rough idea of how the table is playing. It’s not an exact science, but it’s better than nothing. The figures that we are most interested in are the average pot size and average number of players per flop. The average pot size figure gives us an indication of how much action the players are giving at the table. If players are making mistakes, the larger pot size suggests they are putting more money behind those mistakes. We make money when players make mistakes, and if they’re happy to throw around more money along with those mistakes, the more we can win. 1.2 Average number of players per flop. The average number of players per flop figure tells us how loose the players at the table are playing. If this figure is high, then we can assume that the players have low starting hand requirements and are probably poor poker players. On the other hand if the figure is low, we can assume that the players are tight, and will only see flops with a good starting hand. A high average number of players per flop figure indicates that the players at the table have poor starting hand requirements. In general, if players are entering the pot with wider ranges of hands, they’re giving you more opportunities to profit from their mistakes. It’s difficult to win big money quickly from players who like to fold preflop. Take note of the number of players at each table (e.g. 6-seater, 9-seater) in relation to the players/flop, as the 6max tables are more likely to have higher percentages than the FR tables. A screenshot of the PokerStars lobby. It’s a bit of an old screenshot, but it does the job. As you can see on the diagram, the table with the highest average pot is Cassiopea, and the table with the highest number of players per flop is Athor IV. However, the best table to sit at out of the two would be Cassiopea, because Athor IV has a low average pot size despite having the higher number of players per flop. Stats are a rough guide. There is simply no substitute for knowing who the bad players are. The more you play the more you’ll figure out who you can win the most money from. You will start build a mental map of where the sources of money are, and who you want to avoid along the way. The next time you play, have a browse around the lobby and see if any of your favourite players are active. If they are, sit down and start playing some poker. Try and sit to their left if you can, as this will give you a positional advantage. Poker is about taking advantage of the best opportunities you can find. A bad player makes for a good opportunity. Some poker rooms offer you the ability to search for specific players. If this is available, take note of every bad player you come across and search for them before you sit down. This way you can guarantee yourself to be playing against at least one bad player, instead of taking a chance on a table of unknowns. The "player search" feature is rare these days. But if it’s available, awesome. If you want to win money, you should play as many hands as you can against the worst players your can find. You have a selection of tables to choose from, so use your head and sit down at the most profitable locations. You could be the greatest farmer in the world, but you won’t get very far trying to grow crops in the desert. Planting seeds in fertile soil isn’t strategy – it’s the basics of being a good farmer. Similarly, table selection isn’t a science. It’s common sense. Tip: Check out my list of the softest online poker sites for a table of rankings of poker rooms based on the volume of bad players.